Matariki is the Maori name for the star cluster Pleiades, also called the seven sisters. It is a significant time in New Zealand as marking the start of the traditional Maori New Year, first observed by the rise of Matariki and the New Year confirmed as the first new Moon is sighted after that. Matariki is due to begin on 25 June in 2017. Bright stars are considered to be a sign of a warm upcoming season and as a result good crops. It was seen to be an important time for families to reflect of those past and on the future. It was a time to celebrate with plenty of food harvested and stored and in our modern times surely a time for a New Zealand Thanks Giving or a Mid-year Solstice celebration. Take the opportunity to celebrate your New Zealand “Thanks Giving” with family, friends or colleagues at The Tannery. With venues and menu options available for groups from 50 to 500, Matariki is a great time to acknowledge those important to us and celebrate future opportunities. 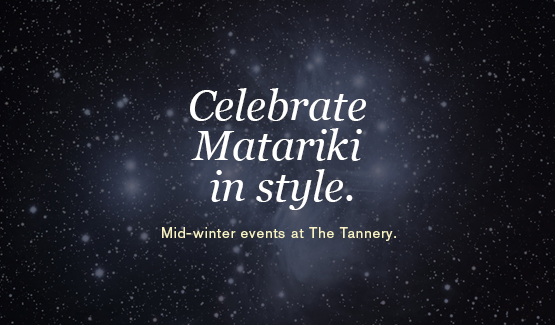 If you are planning a mid-winter dinner, winter function or celebration, The Tannery is perfect for your event. Events in the Atrium suitable from 50 to 500 people, depending on style.